Hi! My name is Steph. When my husband died, I discovered that he had drained our savings and cashed out all our investments, leaving me as close to destitute as I ever want to be. Unfortunately, at the time I was unemployed and being nearly penniless, I moved with my mother, Millicent Spicer. After my parents’ divorce Mom used most of her ready cash to buy a house in Bellbridge Estates, 55+ gated community. If the development had been as promised, all would have been well. But it wasn’t and Mom was nearly as short of funds as me. Mom and I struggled through the first few months together then the developer was killed (A Finger in Every Lie) and I was the chief suspect in the guy’s homicide. Still, I kind of liked helping the police figure out who really did it. Thank goodness, I was able to get a job teaching high school English. So far, I really like the kids and the work. The salary’s not great, but with my lack of experience, I was lucky to be hired so I’m not complaining. Mom and I have settled in, money is a tiny bit less tight, and I’ve been dating a hot novelist. Although, I’m not quite sure where that relationship is heading. He’s been on a book tour and seems to be cooling off towards me. But I guess that’s the least of my worries since the president of the neighborhood homeowners association was just murdered. I was totally shocked when the deputy that worked the other case asked me to help him solve this one too. And even more surprised when he asked me on a date. 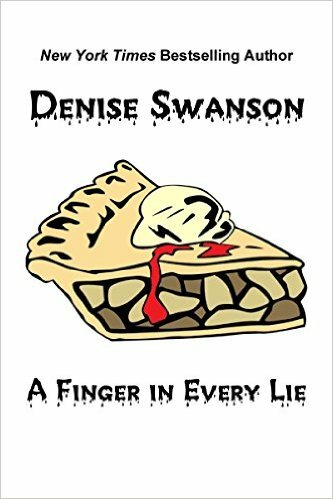 ---Denise Swanson is the New York Times bestselling author of the Scumble River, Devereaux’s Dime Store, and Stephanie Danielson mystery series. As well as the Change of Heart romance series. Read more about Stephanie in the short stories, A Finger in Every Lie and All I Want for Christmas is You…Dead.